As I wrap up another introduction training of Google Apps to students, I wanted to pause and reflect on how much good can come out of increased usage of Docs alone by our students. Thanks to an updated campaign to encourage our incoming freshmen to log in and check their email, we've gotten a large spike in users testing out the Google Apps waters. After the jump are a few items I make sure to bring up during my presentations. If you're not using Docs yet, educationally or personally, perhaps, you'll try it out after reading the following. Before you can press Save Now, Google does it for you. This is huge for students when they encounter unreliable Internet connections, power outages, or if they simply forget to save after spending hours on an important paper. No longer do we have to remind students to save every now and then. And no longer will students lose all of their essay because they forgot to click the save icon. An equally important benefit of the cloud application is the ability to access all of one's documents regardless of location. Students don't have to worry whether they saved their work at home, on their network folder, or on a flash drive. If they use Google Docs, their work will be there, ready and waiting for them to continue, print, or share. An underutilized benefit might be the fact that multiple types of files can be stored in one's Google Docs. There are the obvious - Google Spreadsheets, Forms, Presentations, and Drawings, but then there are the other possibilities including MS Office Documents and recently added Videos. This makes Google Docs almost as feature rich as another must-have tool by the name of Dropbox. 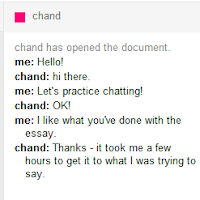 As more teachers choose to utilize Google Docs in their classes, they may choose to take advantage of the robust commenting system built-in and recently updated. Teachers can insert comments in specific parts of a document, thus highlighting spelling, grammar, punctuation or other mechanical issues. Comments can also be made on the document in whole, and teachers can add lengthy reflections online, ones that may have been more challenging and time consuming when done by hand. Although I show this off during presentations, I will be the first to admit that the educational application of real time collaborating isn't quite as relevant. I have had teachers comment on their student's work while the student was viewing the document, so a real time conversation and consequently a live writing review session was conducted, but this is probably the exception rather than the norm. 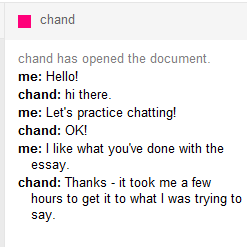 Similarly, the chat feature often wows students and we then battle a bit to tear them away from this feature, but I believe that the tool provides a valuable opportunity, and when encouraged to use this in a positive, constructive manner towards meaningful collaboration, students generally see the benefits and ultimately apply their energy towards the final classroom product. 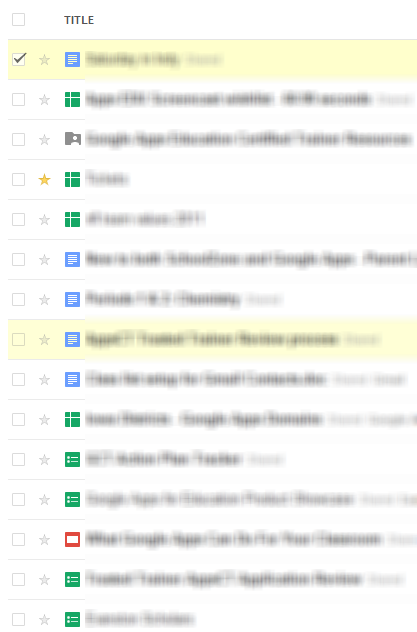 I am fully aware of many of the downsides to using Google Apps. I wrote about several of them in an earlier post. 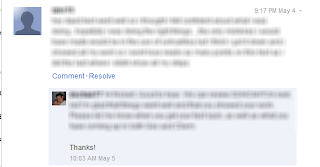 However, one feature that I don't mind is the lack of a built-in spell check. The visual spell check found in most browsers is plenty powerful, and once students are trained to use the right-click/correct combination, it helps them check their spelling all throughout a document, rather than just at the end. For a free product (Education edition), Google Docs provides many features that help our students prepare for not only their current work but also for the future in terms of strengthening their communication and collaboration skills.